Storyline: A little boy named Tim receives an invitation to meet his kindergartner teacher on Thursday at 3 o’clock, at the school on Sunrise Street. As he explores the building and meets new friends, he shares his experiences with the reader. 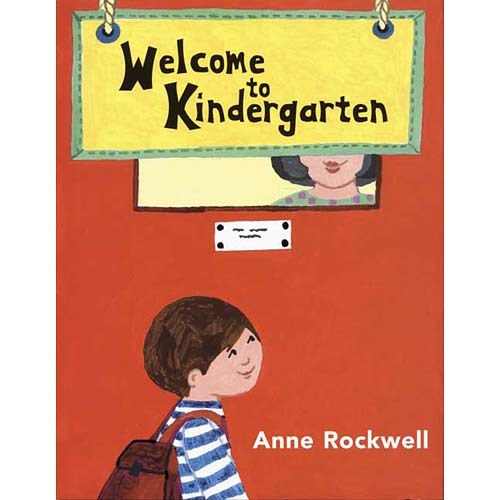 Right from the very beginning, the little Tim feels that everything is too big: the school, the classrooms, the kids he meets on the hallway, and the girl who guides him through the building. Everything seems so intimidating. His tour starts in his future kindergarten classroom where he meets his teacher, Mrs. Jardin. The space feels huge but his mother explains that it’s just big enough for him. There is the science center to learn about plants, animals and insects, then comes the art center with paints and clay where he’s allowed to get messy, further on there are the desks where he and his friends would learn to write and read, they even have a weather corner where he can be the weather boy, and a cooking station with everything from measuring cups to pots and pans. Beyond the time spent in the classroom, he also visits the playground and the cafeteria. At the end of his tour, the teacher gives him a cookie which he eats sited by a new friend he had just made, friend who he’d meet again when the kindergarten starts. When he leaves the place doesn’t seems so big. Just the right size. Illustration: Friendly faces, bright and warm colors, sturdy and familiar object…a universe we know and treasure, a world that offers us comfort, safety and love – this is the style of Anne Rockwell illustration. She fills the page with child-like drawings with very few white spaces. The page is a world on its own and the text more explains the illustration then the other way around. By the end of the book, the reader gets the full experience of a vivid place where fun is the word of the day and learning is just a companion. Other books by the same author: At the Firehouse; Becoming Butterflies; Big Wheels; Trucks; Pumpkin Day; Here Comes the Night; My Preschool; Apples and Pumpkins; etc. How many stars would you give this book? Vote bellow.